SMTP2GO is the scalable, reliable email deliverability solution. Worldwide servers, a robust api, and powerful reporting set us apart. Try their free plan! SMTP2GO starts from $14.00 per month and has an active affiliate program. All SMTP2GO reviews are manually approved and verified. 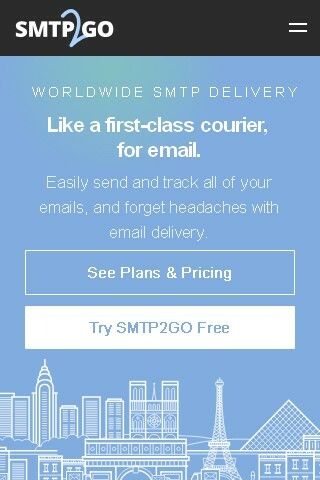 If you want to travel, or if you have problem with sending emails, then this smtp2go service is great for you. Other than that I don’t think it’s all that useful, but some may find some of its uses perfect for them, so. All I can say is that it’s reliable and extremely fast. I love pay-as-you-use services than to be locked in monthly recurring fees. It is far more easier to filter your contacts according to inactivity/open rates etc.. for my blog I am using MailerLite (because it is free untill 1000 subs) and for my infoproduct I am using smtp2go and it’s perfect all in one solution. Currently for testing I am using their free account (I guess it is like 1000 emails per month) and their code is so easy to integrate (coding in PHP right now, not sure about other languages). It is always hitting the primary gmail tab and not the promotions or spam tab. Perfect for advanced internet marketers and webmaster. Before smtp 2 go I was using ActiveCampaign and it was very fine, but a lot of functions were limited (like you cannot create your own special functions for your website). Plus it was so hard with their strict rules and stuff like that. To be honest it was very hard task to find reliable SMTP service with affordable pricing and working without any issues (also good API system). Now we are using smtp2go for a few month and we are tottaly fine with them. You will also get better pricing with higher volume. Many times prior to using SMTP2GO, I sent emails only to have them bounced back to me because the IP address of my email server and the IP address of my computer did not match (they showed 2 different country codes). Now I don’t encounter any issues at all. For our membership site we were thinking about smtp company for delivering registration emails, notification emails and stuff like this. We tried to do this with email autoresponders like GetResponse or Aweber, but some functions were just impossible to do since they are basically newsletter managing services. Now we are staying with this company and it does that job just perfectly. Not sure how this rating system arrived, but during the time we used this company we were quite particularly impressed, all with delivery, their responsiveness and the actual manner of their customer service, which we found very friendly and helpful. I started using Smtp2go 7 months ago. I was very pleased with the service they provide. After a computer crash and installing windows 10 again, my account at SMTP2go could not be connected with Outlook 2013. I really owe thanks to the support team. They helped me with a solution. Now I can check and answer my emails from anywhere, even with my phone. Smtp2go provided great convenience to me. Thanks to the support team!. Folks, Whole story is undoubtedly that me + our pal are surprisingly satisfied, these professionals right now there are literally absolutely pretty good plus just for $14.00 month-to-month that it is fantastic bargain! I really like smtp2go, great product. truthfully far better compared to jMailerPro. SMTP2GO is undoubtedly effective product …. I read a lot of positive and negative reviews, but I still decided to join smtp2go and test their service by myself (I joined about 2 years ago for their 5 dollars per month membership plan). My test costed me just five dollars ..well there is my honest review – there are a lot of smtp servers on the internet, but on some webmasters forum I discovered that a lof of these companies are just smtp2go resellers (so you will for the same service + margin). Their pricing is very affordable to any kind of marketer (well that depends on how much emails you want to send every month) – I have my own software, so I am using every day their api – it is very simple to use and if you want to integrate it to your own software or website it shouldn’t be problem at all. I will easily give it 5/5 because it is the best smtp service out there! Are there any cheaper alternatives with good delivery rates ? I am satisfied with smtp2go but their pricing is a little bit expensive for small blogger like me. Here is my little twist: well first you need to make sure that you will not leave any footprints (follow this if you want to have 99% delivery rate) – what I mean ? Do not send same text over and over again (for example – some text in footer). You need to have domain that has SPF record already setup, this is must if you want to have really good delivery rate of your emails. Also if you want to help to get things done I would suggest you to contact their support team, they are very good and they will not left you alone. As affiliate/reseller of smtp2go I can honestly say that people love this smtp service, they are staying with them for years and almost no refunds (even if they will easily give you your money back if you want). I think this is the most popular email delivery service out there that you can join. I am really satisfied customer, if you will need solution to mass emailing then this is really brilliant service..but their service is really slow and without knowledge..
Is there any money back guarantee if I will buy any paid membership ? I already tried their free plan account but hey it is only 20 emails per day (how I can test their service with 20 emails??).. This is must have service for all internet marketers that want to make money through email marketing, just my 2 cents.. I can recommend their free plan to everyone that want to only send emails (if you are on vacation or something like that, where it is not good idea to login into your usual email client) – with their free plan you can send out up to 20 emails per day which is really enought for me. Sometimes I have problem with their api and login page, I don’t know why but it is like their system don’t know that I have account with them and in few hours it is again okay, contacted support and they don’t know why I am doing wrong. It is only happening with them. It is best way to send emails while I am travelling and in some countries some email providers are forbidden, I am using their free account and I can only recommend it to everyone – free & great. I never had single problem with their support or with delivery rates of my emails, I am making really nice ROI with them. You will hardly ever find better alternative than them – enough said. You have to be very careful and I recommend you to have your own domains with spf record enabled (if you need to send 10 milions of emails, then you need a lot of domains ofc)…that way you can be sure that you will not hit inboxes and then you can make some serious money. You can achieve very niche deliverability with smtp2go if you will do your homework, probably the best smtp service out there. Perfect for all webmasters and internet marketers. No SMTP2GO questions were found. Please submit your first question. Gold plan includes 20.000 emails plus all SMTP2GO email testing tools. Perfect for small businesses. Diamon plan is also comming with email testing tools, also you will recieve priority email support and dedicated IP adress for your promotions. Limit is 100.000 emails per month. Exactly the same as Diamon plan but your email sending limit is increased to 300.000 emails per month. Also additional email credits are much cheaper. For businesses that want to scale up their email marketing campaigns, there is no monthly sending limit. You need to contact them for quote. Let us know, if SMTP2GO changed pricing! Implementing SMTP2GO API is much more easier than with any other SMTP service. You need to hire programmer to actually start using their service. It is important to watch how people react to your emails. With their realtime reports you will instantly know what to improve. Avoid spam or promotions tab with SMTP2GO service. Why to bother with email marketing if all your emails are delivered to promotions tab ? 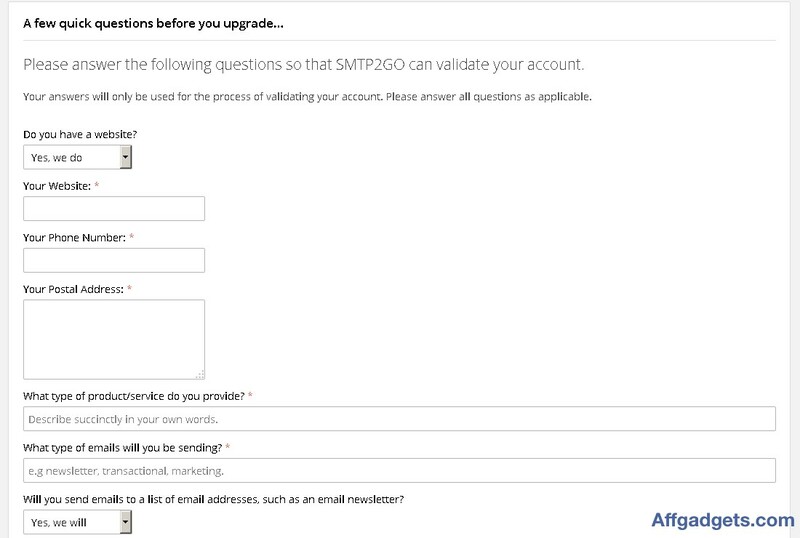 SMTP2GO Assurance SMTP2GO offers free account with 1000 emails per month limit. partner program Start promoting SMTP2GO in order to receive 30% recurring commissions - further details in affiliate section. 24/7 Support Connect with SMTP2GO support group using email or phone. There are many businesses out there having a headache with the way email delivery works now. This should save a person time and money later on. Good thing, there companies out there which intend to work for this very purpose, one of which is Smpt2go. There are 3 options for this. First of all, the ISP or the web host server is going poor in here. This may be configured wrong though. There are times when this occurs to have an unacceptable downtime. This is untold daily and there are restrictions for the number of emails which may be sent. There is also a dedicated email server from the Rackspace in here. When this is purchased from the said company, only $750 would be spent per month. This is the usual reality in here. This is also a way for in-house IT personnel to be hired. This would make the set-up and monitoring possible and easy. This agency also assures that the emails will go to where they are supposed to. It is okay to focus on what has to be done best. The email can be handled. Issues related to this would also be answered and focused. Even success would be guaranteed in here. It would not be impossible to see what is going to take place on the email sent. The transparency of the company is also highly commended. It would not be without a reason actually. It is compatible with many formats so there wont be any problems. For example there is a need to troubleshoot; the company is always available to be of help. They can make sure that each will be supported on the page. There are also instructions posted on their web page for those who want to have a basic knowledge about handling such. The SMTP server would have to be checked in this juncture. This is the SMTP server and it has to be set correctly all the time. This is also mentioned in the control panel. Set up instructions may be checked on all the time. The same is also true with username and password. This has to be done in the most correct manner. The values should be entered must also be researched for. One of the advantages of using the website is that it would make the instant form of communication easy. This can be successful unlike other mail services out there that start failing already. This is a solution for individuals who cannot send emails because of their remote locations all over the world. This would instantly be the answer to solve problems which are being obtained whenever emails are being sent around. It is also possible to see what is happening on the emails being sent. This is true for such like black box for example. For those cannot seem to identify what happened to what they sent out, and then the delivery status will be pointed out. The deliverability of the emails has been proven effective for years. This is expected knowing the experience of the said provider. This would handle whatever number of customers is there to be accommodated. This would then take great results. The usual features are reverse DBS, blacklist monitoring, ISP throttling, DKIM, feedback loops and as well as the blocked ports. These teamed up with major email providers including Yahoo, Hotmail and AOL. These may all be experienced. There is nothing to worry because the infrastructure would always be rock-solid in here. The hardware is just fast and it can be clustered through various servers, which is also good. The only downfall of SMTP2GO is that it would require a massive amount of administrative. This is for the overhead control of such. Aside from this, security may only be observed tightly if a maintenance and setup are all realized. These should all be directed towards the firewall. If there is a need to add more than this, and then learning what SMTP is all about would be the answer. Picking history on it would also be a great way to learn about its history. The only positive side in here though is that these downsides can also be worked on. Something may be done in here in order to deal with this. Another man disadvantage is that SMTP is normally text based protocol. The text in here may also be spoofed at some point. Even the security verification will not be given too. This is observed in the SMTP. If there is a light side in here though, it can be that it would not be possible for spam to happen. Even the tendency for servers to send messages without having to save will most likely happen. When this is downloaded, this will not be downloaded on the whole server anymore. Tracking every sent email is then easier these days. This may be started and finished whenever one wants and likes. This is also a way to send emails into the inbox. Valuable messages have to be seen as well. These would not be bounced, not just reached within the inbox. Rest assured, reports are going to be given. They may be used as a basis in a regular basis. Who would want confusing reports anyway? This is the assurance here. This worldwide SMTP service would indeed enable customers to send email. It does not matter whether one is being sent from a web application or from software which is intended for regular email software, one good example for this is Outlook. This type of service is for any working coming off in various locations. This was found in New Zealand. Ever since, it began to be the solution for individuals who cannot send emails because of their area or location. Handling day to day outgoing mails is not difficult now. This is the assurance for everyone to think upon. Learn more about all of these! Recommend anyone to SMTP2GO and enjoy 30% commissions for all sales credited by you. SMTP2GO belongs to one of the most popular SMTP services in the industry. Help your clients to find better SMTP service and enjoy their sweet commissions. Trial Free to sign up and try. Do you want help with SMTP2GO? Any trouble with SMTP2GO review? 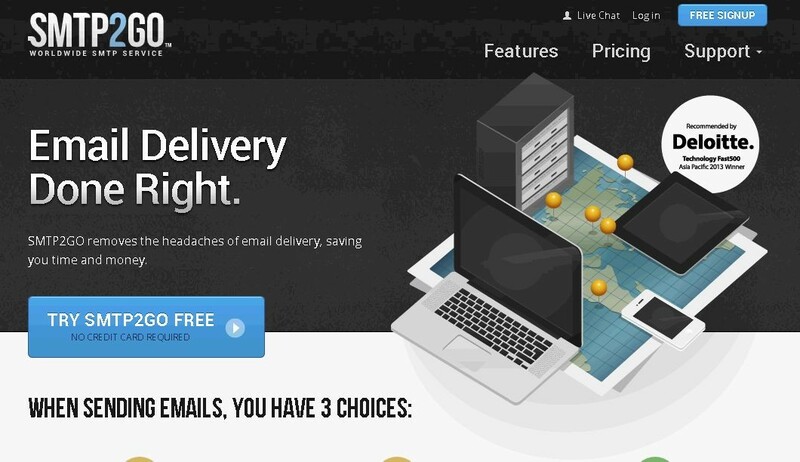 More Email Delivery Services Looking for alternative to SMTP2GO ?